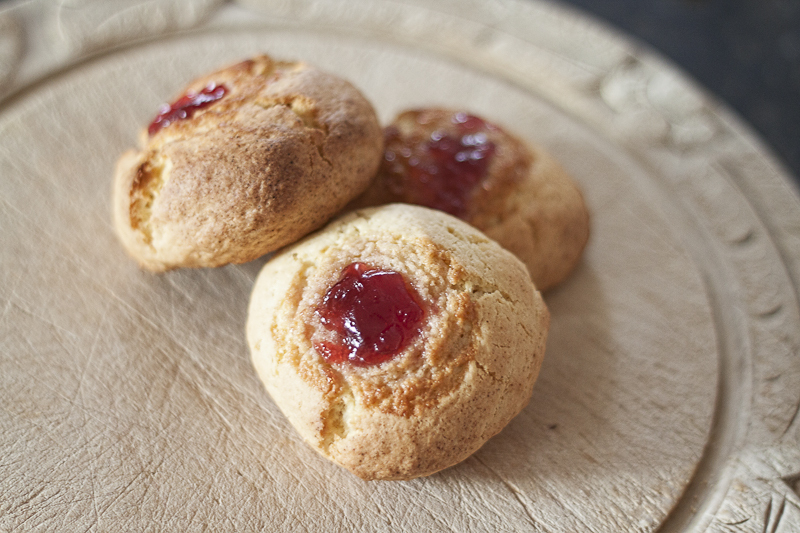 The recipe for these jam buns dates back to when I was a little girl. My Nana (on my Dad’s side) was a fantastic baker and I spent many happy holidays learning everything I could from her. I was too little to reach the counter so I would stand on a kitchen stool and I think it’s wonderful that Bubs now does the same. The buns are similar to scones in texture and taste best when they’re split open and spread with butter or margarine. Ours are topped with raspberry jam but you can use any flavour that you like. Preheat your oven to 200°C (180°C fan), 400°F, Gas mark 6. In a large bowl mix the flour and salt together. Add the baking margarine to the bowl rub in until the mxture resembles breadcrumbs. Stir in the sugar and the vanilla extract. Add the beaten eggs a little at a time until a smooth, firm dough is formed. You won't need all of the eggs so don't worry if you have some left over. Turn out onto a lightly floured surface and kneed gently for a minute or two. Divide into 8 equal pieces and roll into balls. Place the buns on a greased baking tray and press your thumb lightly into the top of each bun to form a small dip. Spoon half a teaspoon of jam into each dip. Bake in the oven for 12-15 minutes or until they turn a light golden colour. Place on a wire rack to cool until the jam has set. The buns have a lovely light scone-like texture and are delicious split open and spread with butter or margarine. If you enjoyed this recipe you can find our other recipes at Cake please Mummy! Ooh actually I wonder if these could be adapted to be egg free. I’ll have to have a ponder and if I come up with something that works I’ll let you know so that Pops can enjoy them too. Oh they do look good – and Bubs looks very happy to be sous chef! Bubs loves it. I’m looking forward to the day when I’m only supervising while Bubs is busy making things herself. Yummy. I am going to make these! I think it was Christmas 2013, so she would’ve been around 21 months. I waited until she could stand on a chair at the counter – albeit with reins attached just in case. She was a late bloomer in the standing and walking department though so I’d go with your gut when it comes to R.